That catch was even more evidence to support the growing claim that Michael A. Taylor will one day win a Gold Glove. Deep into the right-center gap, slides, makes the catch, slams his knee into the concrete at the bottom of the wall. Wow. Taylor and ​the Nats are hanging tough in New York, but that play--along with a few other defensive gems in this game by Trea Turner and Wilmer Difo--is sure to give them a morale boost. Bryce Harper apparently was not fazed by Taylor's painful hit, which could be a good sign about the centerfielder's health, and Taylor is now back out in the field looking fine. In case you were worried, Bryce Harper is out in right taking his normal warmup tosses with Michael A. Taylor (who also appears to be fine). #Nats trail 2-0 in the 5th in Yankee Stadium. ​​Taylor, 27, is in his fifth year with ​the Nationals, and though he's struggling a bit at the plate with a .219 average, he continues to be excellent in the field. He also has been a stolen base machine, matching his career high of 17 a couple days ago...and it's still only June. Michael A. Taylor has matched a career high in stolen bases with 17. ​​Hopefully Taylor gets back on track at the plate soon, but even without much hitting production, this kid is still fun to watch. 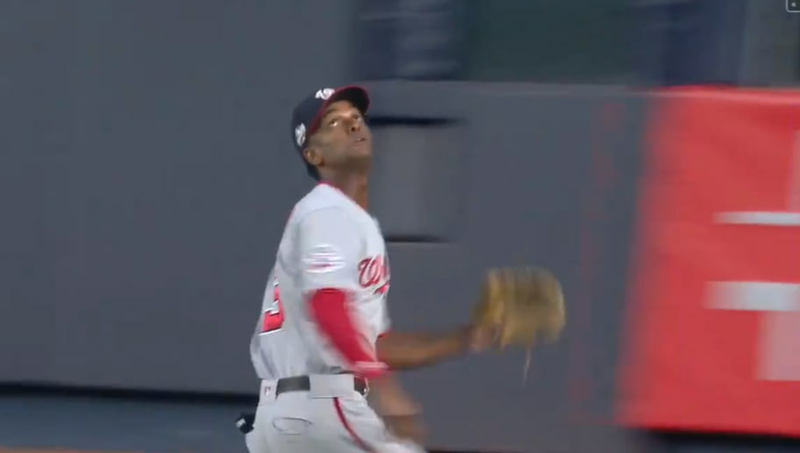 If he keeps making plays like this one he's definitely going to help Washington secure their position atop the NL East. ​DC is going crazy with the Caps parade, and now this play on top of that? It's been a good week for the Nation's Capital.